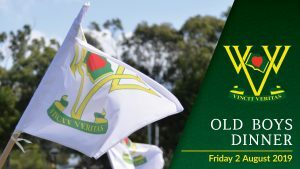 The Villanova Old Boys’ Association Incorporated (VOBAI) is open to all former students of Villanova College, Coorparoo, Brisbane. The Annual Dinner is open to all Old Boys, but generally the greater numbers come from those celebrating a significant anniversary (5, 10, 20, 25, 30, 40 and 50 years) of leaving their alma mater. The VOBAI endeavours to keep in contact with all Old Boys through the distribution of the bi-annual magazine, Villavoice. If you or your family do not currently receive a copy of Villavoice and would like to, please forward your name, final year at Villanova College and home address to Sue Homann by email or contact the College Office on (07) 3394 5690. Should you have any news for the next edition of Villavoice, we’d love to rceceive it. Please forward to Sue Homann by email or contact the College on (07) 3394 5672. Towards Healing is the process for Old Boys wishing to bring forth a Complaint of Abuse. Please download the Towards Healing document for further information. For any enquiries regarding the VOBAI, please contact Harrison Adams via email or on 0433 493 357, or contact the College. Villanova College is an independent Catholic School for boys under the care of the Augustinian Order.